The long awaited sequel to the beloved and bestselling 'The Liars' Club' and 'Cherry' - a memoir about a self-professed 'blackbelt sinner's' descent into the inferno of alcoholism and madness, and her astonishing resurrection. Mary Karr's prizewinning 'The Liars' Club' chronicled her hardscrabble Texas childhood and sparked a renaissance in memoir, cresting the New York Times bestseller list for more than a year. 'Cherry', her ecstatically reviewed account of a psychedelic adolescence and a moving sexual coming-of-age, followed it into bestsellerdom. 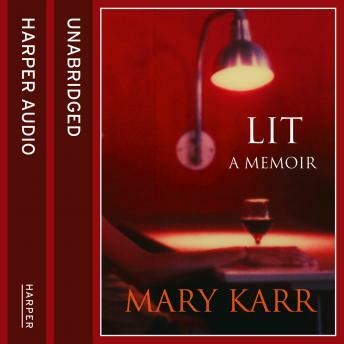 Now 'Lit' answers the question asked by thousands of fans: How did Karr make it out of that toxic upbringing to tell her own tale? Karr's longing for a solid family seems secure when her marriage to a handsome, blueblood poet who can quote Shakespeare by the yard produces a blond son they adore. But Karr can't outrun her apocalyptic upbringing. She drinks herself into the same numbness that nearly devoured her charismatic but troubled mother, reaching the brink of suicide. A hair-raising stint in 'The Mental Marriott' with an oddball tribe of gurus and saviors awakens her to the possibility of joy again, and leads her to an unlikely faith. Not since St. Augustine cried, 'Give me chastity, Lord - but not yet!' has a conversion story rung with such dark hilarity. 'Lit' is about getting drunk and getting sober; becoming a mother by letting go of a mother; learning to write by learning to live. This hotly anticipated sequel brings Karr's story full circle; it will endure in the hearts of readers alongside her influential and beloved earlier books. Simply put, it is a triumph.